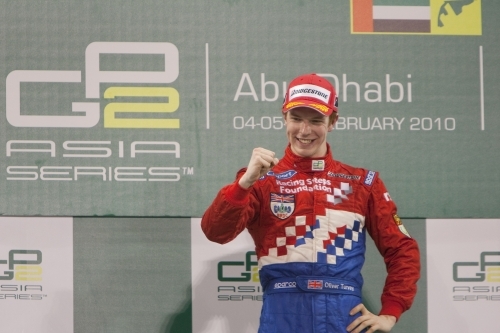 Oliver Turvey claimed his first GP2 Asia Series victory by leading home team-mate Davide Valsecchi in an iSport one-two at Yas Marina. Oliver took off perfectly passing poleman Charles Pic who was then immediately under the pressure from Valsecchi. Comfortably leading, Turvey pitted on Lap 10, emerging right in front of Valsecchi. The Italian showed no mercy and immediately attacked his teammate on the outside of Turns 11, 12 and 13. The two cars had a wheel to wheel coming together, went off the track before rejoining, Davide ahead of Oliver. However, before the lap was complete, Oliver executed a committed move around the outside of his team mate to retake the lead. The Safety car was briefly deployed but Oliver kept the lead at the restart and no matter how much pressure Valsecchi would put onto him, he held his own till the finish line, 0.6s ahead of the Series leader and Bianchi who scored a podium on his GP2 Asia debut. After the weekend, Oliver is second in the drivers’ standings with 16 points, with team mate leading with 35 points. In the teams’ championship Norfolk-based iSport is on 51 points, streets ahead of nearest rival DPR on 15.